TAB HUNTER (Andrew) is a product of Hollywood’s golden age, Tab Hunter became Hollywood’s golden boy. His first starring role, at the tender age of 19, was opposite Linda Darnell in the romantic South Seas adventure ISLAND OF DESIRE. An instant success, Tab went on to star in over 50 major motion pictures, including BATTLE CRY, THE PLEASURE OF HIS COMPANY, THAT KIND OF WOMAN, GUNMAN’S WALK, THEY CAME TO CORDURA, RIDE THE WILD SURF, THE LOVED ONE, THE LIFE AND TIMES OF JUDGE ROY BEAN, and the Academy Award-nominated DAMN YANKEES. A few of Tab’s leading ladies include Sophia Loren, Natalie Wood, Gwen Verdon, Rita Hayworth, Lana Turner, Debbie Reynolds, Kim Basinger and Michelle Pfeiffer. Multi-talented Tab also enjoyed a very successful recording career that culminated with one of the top records of the rock and roll era. His recording of YOUNG LOVE zoomed to number one on the charts worldwide (knocking Elvis out of the top spot) and remained there for twelve weeks straight! Tab subsequently starred in his own television series for NBC, was nominated for an Emmy for his performance opposite Geraldine Page in PLAYHOUSE 90’S PORTRAIT OF A MURDERER and has guest starred in over two hundred television series episodes. He also appeared on Broadway with Tallulah Bankhead in Tennessee Williams’s THE MILK TRAIN DOESN’T STOP HERE ANYMORE. Tab’s film career took off once again in the 1980s/90s as he starred in such films as John Waters’ POLYESTER, GREASE 2, and the cult comedy-Western LUST IN THE DUST. Turning to producing, Tab teamed up with Allan Glaser to produce LUST IN THE DUST and DARK HORSE (starring Mimi Rogers and Ed Begley, Jr.). Upcoming feature films include the historical drama THE ROAD RISE UP and BLUES IN THE NIGHT, based on a best-selling novel by Evelyn Keyes, to be directed by Peter Bogdanovich. Tab can now also add best selling author to his list of credits. 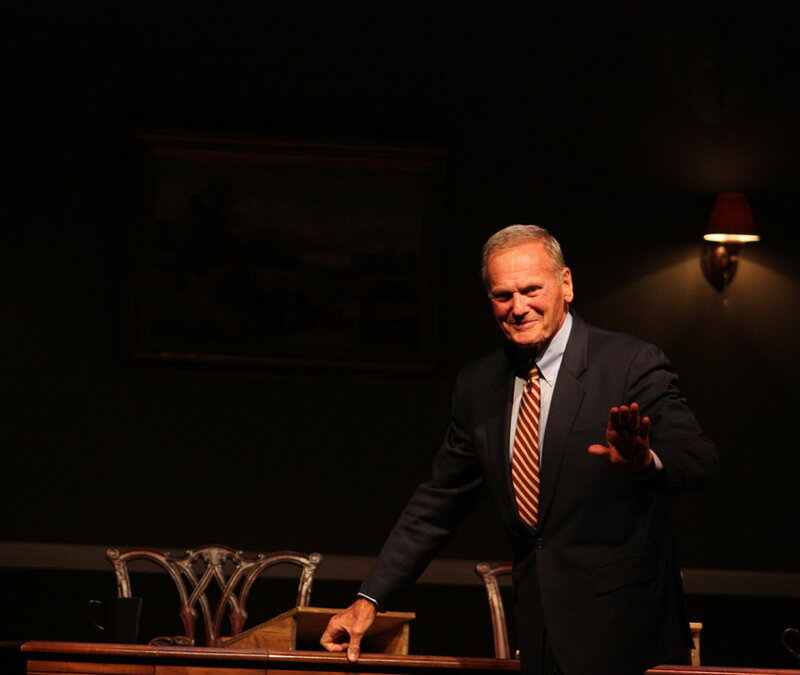 His recently published autobiography TAB HUNTER CONFIDENTIAL became a national best seller and garnered critical raves and praise from the NEW YORK TIMES, DAILY VARIETY, SAN FRANCISCO CHRONICLE, WASHINGTON POST, VANITY FAIR, ENTERTAINMENT WEEKLY, NEW YORK POST, GOOD MORNING AMERICA, LARRY KING LIVE, CBS SUNDAY MORNING and dozens more. Tab keeps busy developing independent films projects and riding horses. Morgan Sills is bringing great shows – and great actors – home from New York.Sills chose A.B. 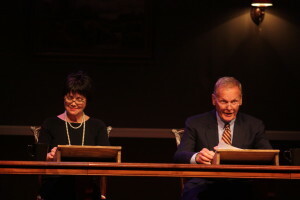 Gurney’s “Love Letters” as Judson Theatre Company’s opener, and what a show it was! 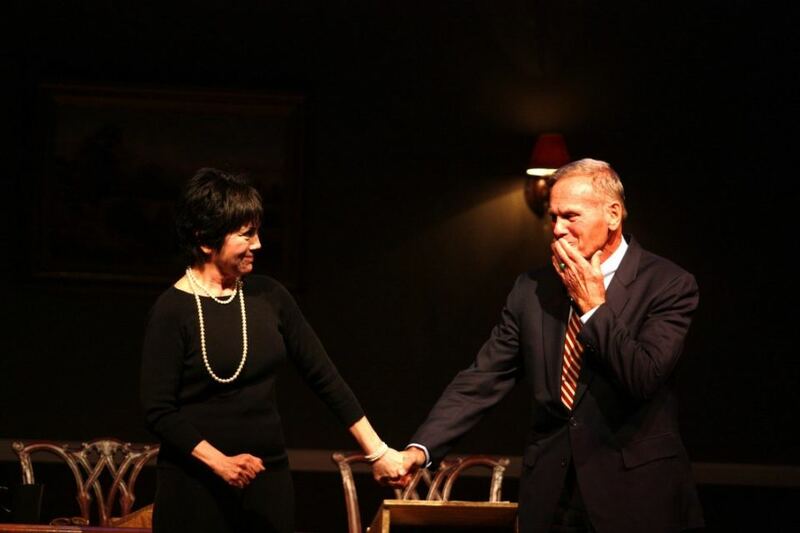 Deceptively simple (two actors reading at a table) it quickly grew deeper and more profound with Tab Hunter and Joyce DeWitt (“Threes Company”) weaving a complex narrative web in two acts. Old theater pals Tab Hunter and Joyce DeWitt, directed by Daniel Haley, were superb in the roles of two friends from childhood whose parallel lives are conveyed through their letters. “Love Letters” is now one of the classic American plays – fun, funny, and moving. This production showed why. I’d seen it before – years ago in New York at the Edison with Jane Curtin and Edward Hermann during its first regular run, changing actors every so often the way it had earlier that year when it initially played off-Broadway. I liked it a lot — but…I loved the one I saw here. No production of “Love Letters” could have been more elegant, more delightful, more enthralling than this one. Hunter and DeWitt are so well-matched, so balanced in that intricate dance of timing and subtlety you see when wonderful actors are at work. What they do – seated at a table and simply reading – spreads and deepens two lives portrayed through letters to each other with such ease, drawing us all in, catching us all up. A.R. 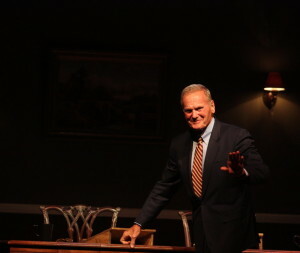 Gurney’s two character play was a Pulitzer nominee for drama two years after its start, in 1990. In time it became a staple of regional and community theater. A number of road companies traveled the show. It ran as a fundraiser for the Charleston Stage and later for Elizabeth Taylor’s AIDS foundation when she and James Earl Jones gave a benefit performance of the play at $2,500 a ticket and raised $1 million. Even if you miss “Love Letters” — don’t miss “Tuesdays with Morrie!” Both shows are examples of the seasoned professional actors Sills means to bring to this market. Performing artists of their caliber playing live, on a local stage, bring the real theater here. If you saw the first one, my bet is you will want to return for the second. Anybody who likes a good show, one with something to it, played with such deceptive grace and such real heart, is guaranteed a great time, a fine evening. GO! JOYCE DEWITT (Melissa) is most widely known to audiences for her starring role as “Janet Wood” in the ABC Television hit series THREE’S COMPANY. She also has an extensive background in the Theatre, working both as actress and director in a Stage career which spans over forty years. Miss DeWitt has starred in numerous theatrical productions including most recently IT’S CONNECTICUT by THE SIMPSON’S writer Mike Reiss, MISS ABIGAIL’S GUIDE TO DATING, MATING AND MARRIAGE!, A SCATTERED, SMOTHERED and COVERED CHRISTMAS MUSICAL, the Canadian premieres of the 2000 Pulitzer Prize winning play DINNER WITH FRIENDS and Alfred Uhry’s Tony Award-winning play THE LAST NIGHT OF BALLYHOO. Other recent stage performances include the North American premiere of the Australian comedy DAYLIGHT SAVINGS, the British farce NOISES OFF, the revival of Cole Porter’s ANYTHING GOES, and the Broadway musical OLYMPUS OF MY MIND, for which she completed the cast recording – her first record album. Miss DeWitt’s other Theatre credits include starring roles in CHAPTER TWO, SWEET CHARITY, DAMN YANKEES, MIDDLE OF THE NIGHT, STAR SPANGLED GIRL, THE CRUCIBLE, MEDEA, TARTUFFE, A HATFUL OF RAIN, DESIRE UNDER THE ELMS, MACBETH, THE MIKADO, LI’L ABNER, SOUTH PACIFIC, THE MAN WHO CAME TO DINNER, PETER PAN, BRIGADOON, ALL THE WAY HOME, A MONTH IN THE COUNTRY, THE TEMPEST, THE IMPOSSIBLE YEARS, DRACULA: AN ORIGINAL ROCK MUSICAL, STOP THE WORLD, I WANT TO GET OFF, AND SAME TIME, NEXT YEAR. Her other television credits include singing and dancing in numerous specials having had the pleasure of appearing with such wonderful talents as Greer Garson, Ann Miller, Perry Como, Bill Cosby, Anne Murray, Tony Randall, Rich Little, Cheryl Ladd, John Ritter and Steve Martin. She has also made numerous guest-starring appearances on popular Television programs including The LOVEBOAT, THE OSMONDS, HOPE ISLAND, CYBILL, TWITCH CITY, and LIVING SINGLE, as well as starring in the Television Movies WITH THIS RING and SPRING FLING. Miss DeWitt holds a Bachelor of Arts Degree from Ball State University and a Master of Fine Arts Degree from UCLA where she was awarded the Master of Fine Arts Fellowship as well as the Clifton Webb Scholarship. Born in Wheeling, West Virginia, on April 23rd, Miss DeWitt is one of four children. Her childhood years were divided between West Virginia and Indiana. Having had the good fortune to work with such wonderful human beings as Valerie Harper and Dennis Weaver, whose dedication to ending hunger and homelessness in our world and support of environmental issues is boundless, Miss DeWitt participated with members of the House and Senate at the Capitol Hill Forum on Hunger and Homelessness and has hosted presentations for the Family Assistance Program of Hollywood. She is most grateful for having been allowed the privilege of hosting the International Awards Ceremony at the White House for the Presidential End Hunger Awards, as well as co-hosting, with Jeff Bridges, the World Food Day Gala at the Kennedy Center.